A little saturday painting test over an old stylised drawing from my sketchbook. I try in my freetime ( very little , after finishing my pro paintings commissions ) to get used to the new 'dulling' brush possibilities in Krita and work on my presets. License: CC-BY David Revoy, www.davidrevoy.com, 26 may 2012 . Update : added a bigger resolution, with a bit of compositing and correcting on the top. Me and Gimp 2.8 start to be friends. I really would like to know what type of hardware you're running on David. 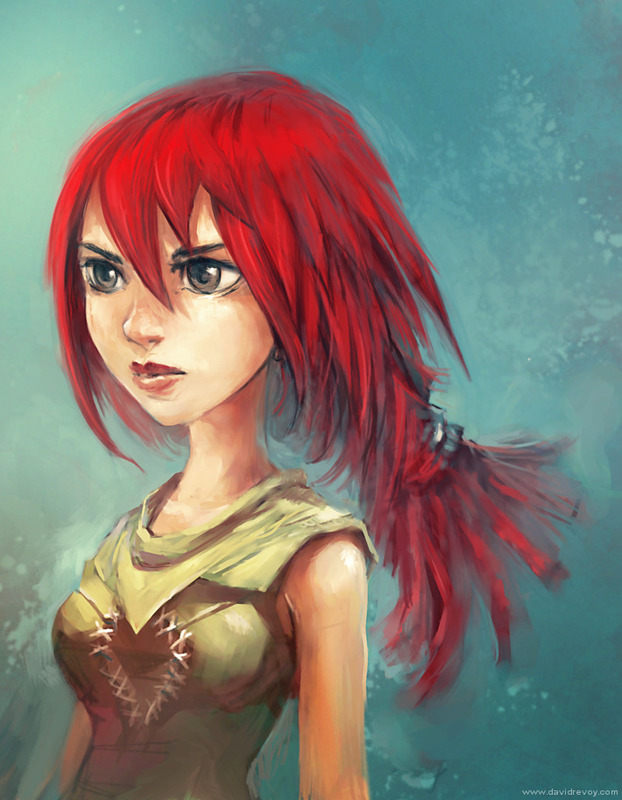 I mentioned you over on G+ so you can see my experience with Krita. I positively love it and what can be accomplished with it, however, it was extremely buggy for me. Please consider the read over on my G+ profile. I really would like to get to the bottom of this and also help the Krita with bug reports. Joli. J'aime beaucoup la palette de couleurs. Quel talent, je repars frustré lol. @Godzillu : Merci Godzillu ! @Michael R. : I 'll try to make an article about my hardware. For a short version : icore7 870 , 8GB ram , nvidia Gt220 , intuos 3 A4 , kubuntu 12.04 'simplified' ( setup like a Gnome 2, no desktop effect ) and also a Xubuntu desktop alternative. Si je puis me permettre une petite remarque en dehors de l'image mais au niveau de Krita : Ce serais bien de faire une vidéo pendant un speed painting sous Krita. Un peu comme la fille au dragon sous Alchemy, My Paint et le style chaos. @Mucrobulle : Merci Microbulle. C'est bien noté pour la vidéo, il faut que je trouve un moment après les paintings que je fais déjà pour le boulot pour en faire un en filmant ( c'est toujours une tension supplémentaire de se filmer l'écran ) . Avec un peu de chance, je trouverai le temps cet été. Merci pour le retour. Hey David! You're absolutely master at digital painting, esp. with Krita! How it is possible for you to create such beautiful images without being tired of the Krita's speed ? What one could improve to work fleuently in this intriguing graphics program? Intel Quad-Core@2.66 Ghz, 8 GB Ram, Ati Radeon 5800 (1 GB Ram), Win 7 Ultimate. For the 800MB , it's normal ; Krita depends of a lot of library on Linux , and on Linux KDE system Krita package to install weight less than 25MB and it's speed to launch as well. At the moment , there is the developpement of a Krita branch named 'Krita Sketch' targeting a 'Win tablet version' audiance, sponsored by Intel. Maybe this work will improve the Windows version in the future, but not sure. I've tried most experimental builds of Krita on windows 7 ( both the entire calligra suite versions and the standalone krita versions ), and some builds work better than others ( and newest builds aren't necessarily the best ). So try using different builds and you might get better performance. If you've only tried the calligra suite version, try the standalone installer for windows. That said, my problems with krita on windows were stability and crashing, not speed. I never experienced lag that would frustrate me or prevent me from using it. I've been able to produce several images using krita on windows, and don't recall speed being a frustration. So it is possible to use krita on windows - if you can find a version that works happily on your hardware. And make sure you save - a lot.